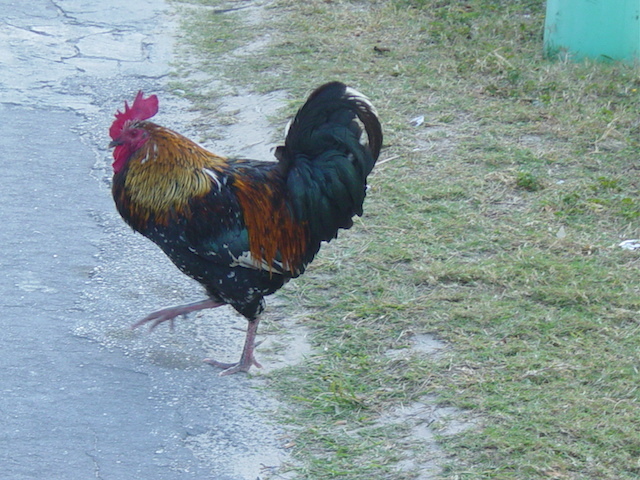 This week it is more of a pictorial blog with a few good memories from right here in Eleuthera. I was looking back at pictures from the first summer we were here – 2005 – and decided that it would be good to share a few of them with you ! 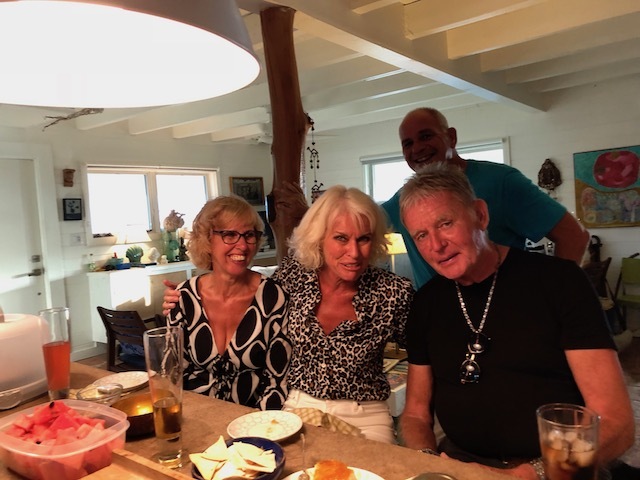 Plus a few new memories in the making from just the other night down on Cupid’s Cay with Dan and Larry…..
Fun with our Swedish friends …..
We often have friends visiting us these days but that first summer our great friends from Sweden – Leif and Gunilla came to visit. We had lots of great times with them – not least the night that we drank coconut rum and sang along to many Abba songs !! Eat your heart out Mamma Mia ….. The picture above was taken on a day out to Harbour Island – fooling around on a golf cart with Jane . 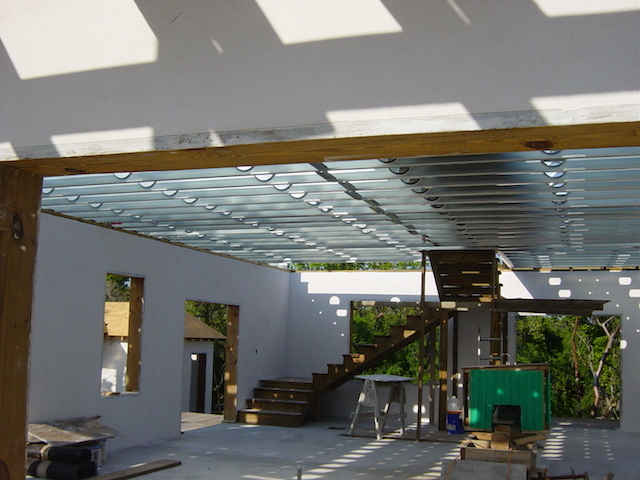 This was when we thought that roosters were fun to see – then we learned about their nocturnal habits…..
Yellow House – the staircase just going in…..
That summer we were working on the construction of the Yellow House and the 2 pictures above show the long steel beams that make for such a beautiful big open plan space. No upper floor yet in these shots. And me with mine !!!! 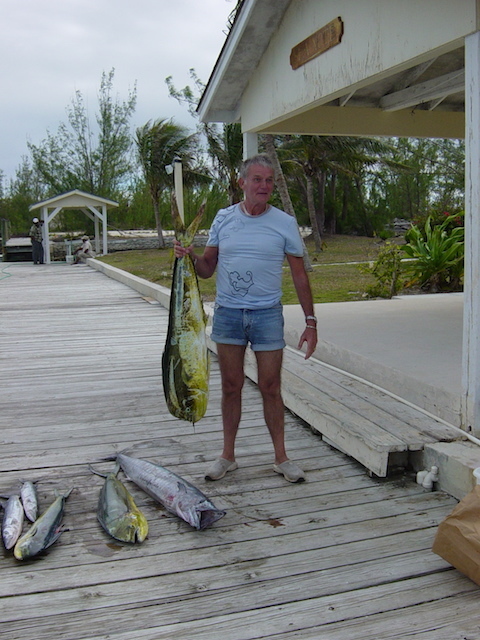 Another day out on the water with Bob catching a big wahoo – I nearly called it a yahoo ! – but we hadn’t heard of yahoo back then. 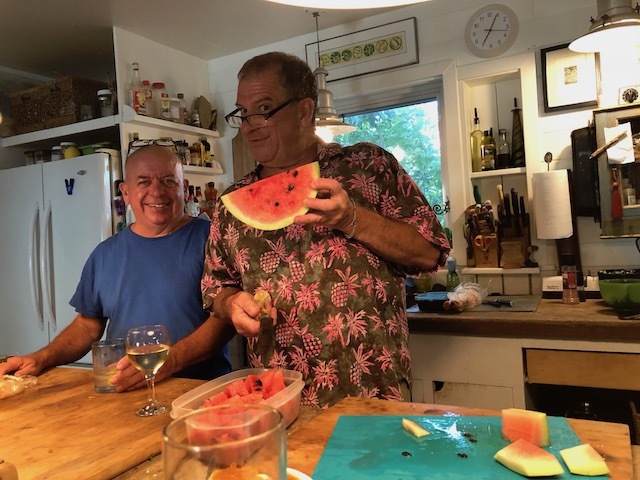 Anticipating a delicious meal with Dan and Larry on Cupid’s Cay – yes now in 2018 ! So bringing things back up to date, a report of a great evening spent in the company of Dan and Larry down at their house. 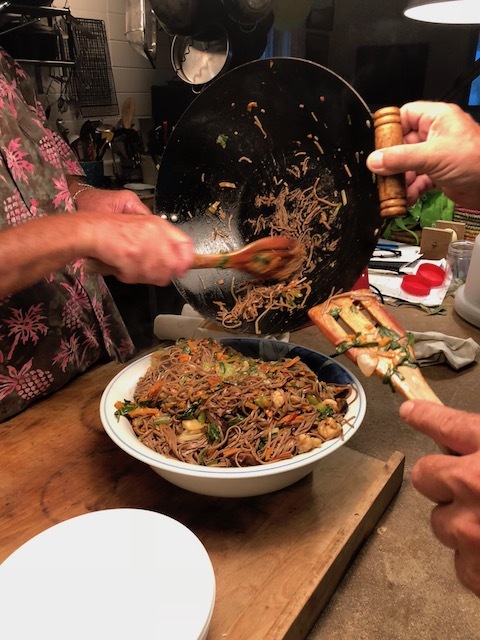 Dan is a great cook and after he had told me about making a dish called yakisoba I was eager to try it myself – eating that is – not cooking it ! It is basically a noodle stir fry dish – but the time Dan spent living in Japan a good few years ago means that he has a real flair for the slightly exotic cuisine. He is a very talented cook as many of you will know and this dish was terrific……. The pair of them are generous hosts and there is always a great musical backdrop …..
Look out for this when over here. We nibbled on Dan’s secret chips with this pictured above. 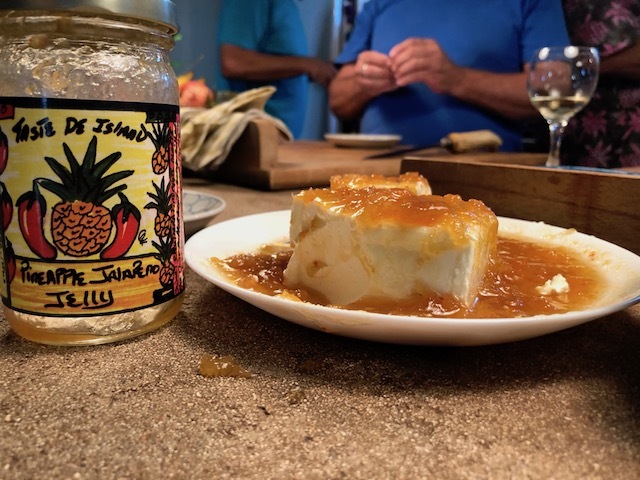 It is a locally made pineapple jalapeño jelly over cream cheese – absolutely delicious. I will be picking a jar of it up whenever I see it here. 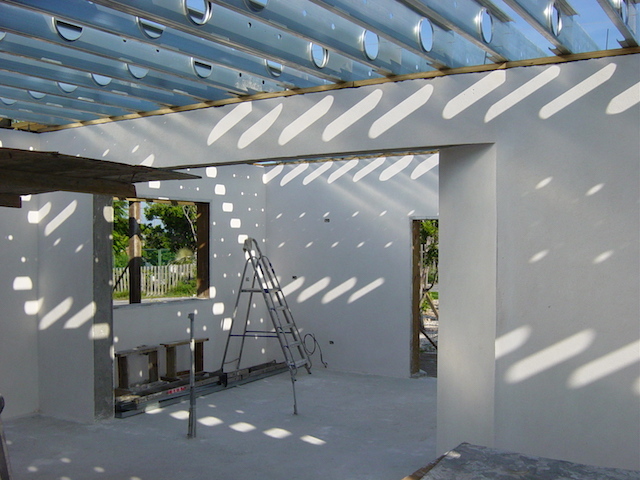 So there we are for this week – memories from 13 years ago and new ones in the making….. Cooking parties and the new health clinic progress. Lovely to hear from you as always …..
Well so much for “the best kept secret places to eat”!! You are always the best guests and we LOOOOOVE our JANE! Ooops – didn’t know it was secret – but as you say – not anymore !! i just adore yakisoba! and anything with pineapple (jalapenos a bonus!). even the watermelon looks amazing :) love seeing the throwback photos of you and bob, as well. thank you for sharing the eleutheran dream with us all. Lovely to hear from you Andria and glad you enjoyed the blog…….